In lesser hands, The Order of Myths would be a documentary about the oldest Mardi Gras in the United States. That distinction belongs not to New Orleans but to Mobile, Alabama, as the film and its interview subjects brag. But in the hands of Margaret Brown, it’s really a film about race in 2007. Fifty years after “separate but equal” was ruled unconstitutional, the people of Mobile seem to have sorted themselves into amiable cliques by race. In Mobile, there are two Mardi Gras. There is a white Mardi Gras and a black one. Each has its own king, queen, and royal court; its own floats; its own mystic societies (the film’s title is one of them). 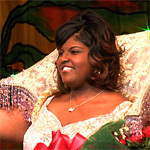 This year’s white queen is the daughter of one of Mobile’s more prominent citizens. Streets are named after her forefathers. The black queen is descended from some of the slaves brought to this country by the white queen’s ancestors. “Her people owned my people,” she says, not accusingly, but pondering the strange history that has brought them back together. The black queen talks of how much money she will have to spend on being queen: by the time she pays for the dress and the jewelry and the preparations, it adds up to the price of a car. We get the sense that she knows she’s going to be paying it off for years. Conversely, it’s impossible to imagine the white queen even having to consider money; surely her family will cover the cost of her coronation without blinking. The white queen learns how to appreciate wine at an etiquette class with the other debutantes coming out into society. One wonders whether a black gathering where teens were being taught to drink alcohol would be allowed and accepted by the local police. But most of us don’t live in Mobile, where the participants seem to have reached a comfortable separate-but-equal truce. “Equal” is probably too strong a word. The white court comes from wealthier families and seems to be healthier (everyone in the black court is obese). Both queens have custom-made gowns, but the rest of the white court seems to have more expensive clothes. The white mystic societies own most of the floats in their parade; the black mystic societies rent theirs from the white societies. But equalizing the two camps is an impossible task. I can’t imagine a single member of the black court we meet feeling comfortable and having a good time at the old aristocratic, rule-bound, functions of the white court. It’s easier to imagine a white youth having fun among the modern, exuberant black court, but it’s hard to imagine the crowd not suddenly losing some of that unrestrained joy out of self-conscious awkwardness. Brown’s instinct not to be judgmental was right. By sticking with her subjects and not looking down on them, she gives us as good a portrait of race in America as I’ve seen in years. The film isn’t perfect. In particular, Brown doesn’t quite know how to end the film. Nevertheless, it’s an excellent documentary that offers a lot more than just Mardi Gras. W of Mobile: Interesting points. 1) none of the debutantes nor their knights are teenagers - all are of legal drinking age.